We wrote in January amid all the back slapping about the ‘completion’ of Kings Cross Square that there would be issues with keeping it clean and tidy and a welcoming public space. In any public realm one needs to be clear who is keeping which bits of it under control – in this case a set of agents that needed a map to explain it. 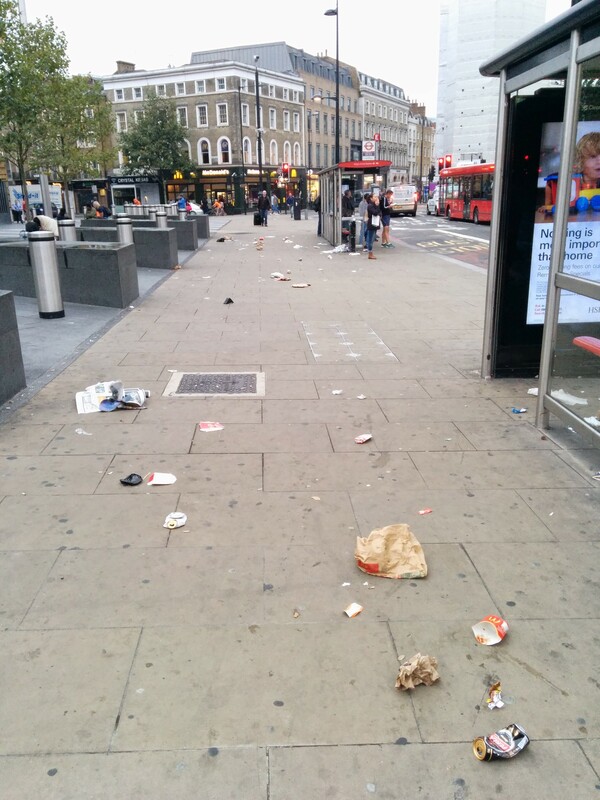 Local resident Andrew reported last week that the area behind the bus stops is repeatedly hugely messy in the mornings – as this photo shows, and he has sent others. According to the map Camden supplied to us this area is the responsibility of TfL. Andrew is trying to track someone down to sort it. In this particular picture one can see a lot of MacDonalds wrappers amidst other take away and off licence debris. Maybe they should get out with a McBrush too. This entry was posted in Kings Cross Station Refurbishment, Street Tipping, Mess, Trash and tagged King's Cross square, macdonalds kings cross, mess, trash. Bookmark the permalink. Mcdonalds should be made to clear up their mess and also remind customers not to throw rubbish on the pavement. However, I see no bins, why not install a few rubbish bins? Hi Will, Cllr Paul Convery confirmed that whilst it’s a TfL highway, Camden has cleaning responsibility. I emailed Cllr Abdul Hai and StreetEnvironment@camden.gov.uk, Abdul has asked “officers to investigate” and to get back to me (awaiting). The area looks cleaner, not sure if this is due to action taken, or less interest in takeaway over the past few days. I have noticed coming back very early on Sunday morning how this area seems like a chillout area for people who think nothing of throwing everything on the floor. I don’t understand why people just don’t use the bin but I am not aware how easily identifiable (or indeed if there are any) these are. It really does look like a bomb has hit the place on the weekends and I hope they actually force the fast food shops to help clean up/contribute towards it. There should be a bin outside the McDonalds on the corner for sure as all the drunk and disorderly congregate outside as well as the bus stops they will stand at as higher thinking usually takes a back seat at 4am. In their plans they should have made a provision for this as perhaps in mainland Europe they can have squares like this and be sure people won’t litter but unfortunately this is Britain. It’s even worse around the corner on York Way, again close to the bus stops and again usally full of McDonalds rubbish. I agree with others though, in that there aren’t sufficient bins. They should install separate bins for recycling purposes also.